A microfibre mop is a great tool for cleaning tile flooring and can also be used to reach any high up tiling without straining your arms! Remember to leave cleaning floor tiles till last. Cleaning the bathroom might seem a bit daunting at first – cleaning the toilet requires different products and methods than cleaning the shower, and cleaning all the tiles in the bathroom can seem very complicated! Never fear – here are a couple of strategies for cleaning tiles that make the process easy and effective. A steam cleaner can be used on various surfaces in your house – on materials from carpets to ceramics – and it can remove built-up dirt. By heating the material, a steam cleaner opens up pores in the material’s surface to release the most tightly held muck. All you need to do is apply steam to the surface of the tile, and then wipe off the dirt! The simplest recipe for making your own cleaning solution for tiles is to dilute a mixture of vinegar and baking soda in water. Put this solution into an empty spray bottle. The vinegar acts as a degreaser, while the baking soda scours the surface and eliminates odours. For better results, the solution should be left on the tiles for a minute to fully dissolve the build-up, and then should be wiped off with a damp microfibre cloth. A more powerful homemade concoction involves a paste of bleach and bicarbonate of soda. Bleach functions as a disinfectant and will whiten your tiles and grout back to their original tone, but can give off some very nasty gases. If you do decide to use bleach, then work carefully in a well-ventilated area with gloves and possibly a mask. After applying the mixture, leave it on for at least one hour before washing it off. Put on some rubber gloves and make sure the room is well-ventilated. Run the shower on a high temperature to open up ceramic pores. Test your cleaning solution on a small area first to ensure there is no damage. Use an old toothbrush to scrub the tile grout. If making your own cleaning solution from scratch seems to be too complicated, don’t worry – there are plenty of specialist products on the market to make your job easier. Remember to follow the product’s instructions and to use it in a well-ventilated area, and also wear gloves to protect your hands. 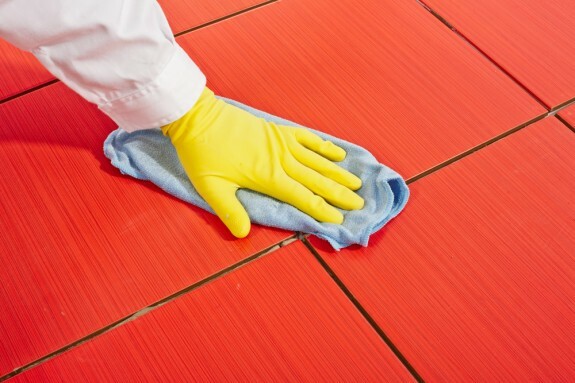 Tile cleaning can be quick and easy with the right products and techniques – try it for yourself!